If you’ve been looking for a way to legitimately use the word “horny” in a conversation, then this Kiwano Melon is the fruit for you! This reminds me of a punk rock tiger fish! It is a spiky orange fruit with animal-like yellow spotting. The flesh is a gorgeous bright green that is in an amazing geometric pattern. 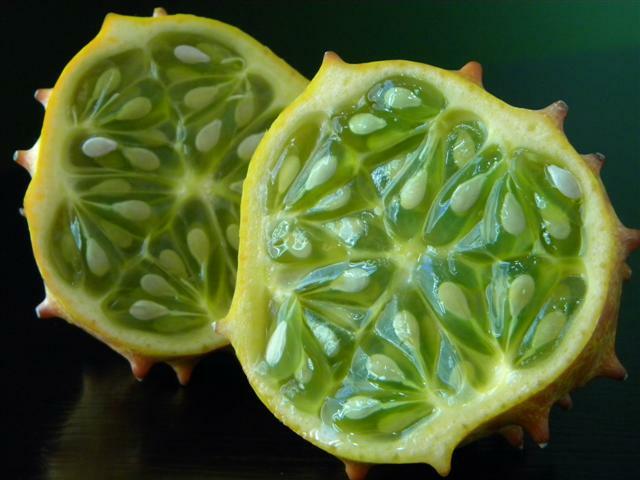 Very gelatinous – each seed is surrounded by a little jelly sack with a very firm membrane – its not like you can bite through and get to juice. Lots and lots of edible seeds (think cucumber). The jelly part is a lot like a cucumber with the slightest hint of melon or kiwi or maybe lemon. The seeds are fairly neutral tasting and somewhat annoying – they aren’t easy to chew or swallow. Way more fun to look at than eat in my opinion. Granted I have not yet doctored it up with sugar and poured it over ice cream but I could douse lots of things in sugar and down them with a bite of ice cream and I’m not sure that justifies eating them. 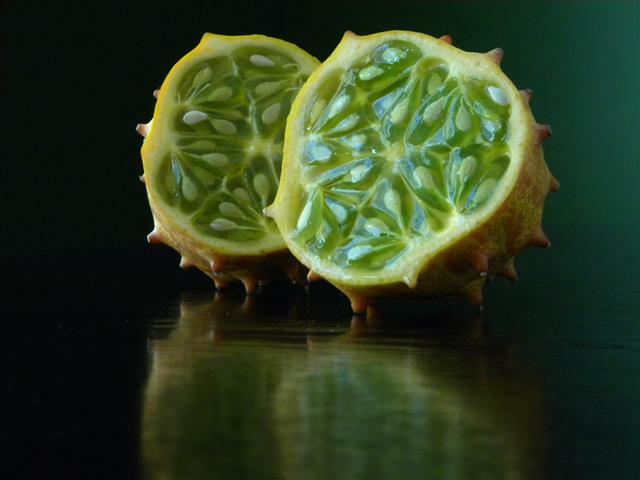 Also called African horned cucumber or melon, jelly melon, hedged gourd, English tomato, melano or Kiwano melon but the best of the best names this guy goes by is a Southwestern US nickname– Blowfish Fruit! When in season, you can buy Kiwano Melons at most asian stores, some standard grocery stores and online here. If you get them online, a small amount will go to support the Fruit Maven. So thanks in advance! I certainly agree with your assessment of the flavor – very photogenic, not so delicious. From reviews of this melon I’ve seen, I can only come to the conclusion that the flavor varies widely (probably due to how ripe it is). Mine had no hint of bitterness or cucumber flavor. Instead, it had a very agreeable flavor, probably best described as a mix of banana, lime, and kiwi. Not too strong, not too sweet, but tasty nonetheless. 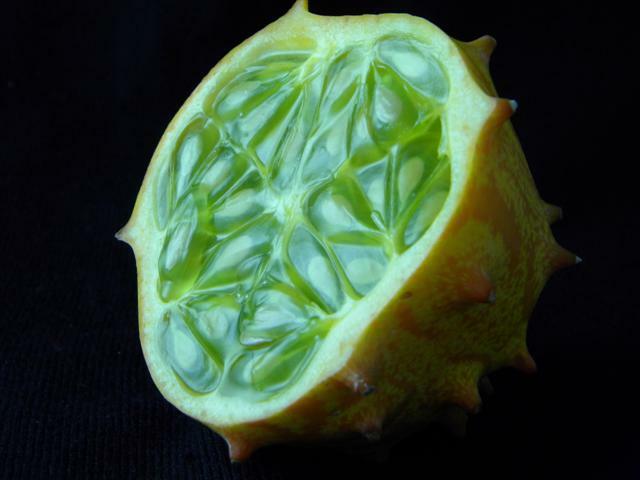 The citrus-like seed sacs full of gelatinous fluid give it the color and texture of lime jello. If only someone could breed a seedless variety, I’d rate it as a five-star overall. Sadly, the seeds make it even harder/slower to eat than a pomegranate. So you either need to eat it slowly, chomp the (unappealing) seeds, or just scoop out the innards, cook them down, and strain the seeds out (haven’t tried this last technique).